Baseball is a sport that dates back as far as 1744 and formats of the game have been in place until the modern era today. The game is predominantly big in North America, Canada and Japan. The game is played worldwide with the pinnacle of sport coming from the World Series of Baseball. Ironically, this event is only competed by North American teams. The object of baseball is to score more runs than your opponent. The idea is to hit the ball thrown at you as far as you can before running around 4 bases to complete a run. Once a player manages to get around the four bases before being tagged out, then another batter steps in. A game is played out between two teams, each made up of 9 players. The game lasts for 9 innings with each team alternating between batting and fielding in each inning. The scores at the end of the innings are added to a cumulative score and the team with most points wins. Each team has three outs per inning before they then swap roles. Each inning can be broken down into the top (where the away team bats), and the bottom (where the home team bats). The field is split into two sections: infield and outfield. Separating the infield and outfield is a diamond shape with four bases, spaced at 90 feet apart each. In the center of the infield is the pitching mound where the pitcher stands and throws the ball toward the batter. The batter stands at the home plate. The other three bases are known as first base, second base and third base. The batter must touch all bases before successfully scoring a run. The bats are made out of either wood, aluminium or metal materials. The ball is white with red stitching and is roughly 3 inches in diameter. The fielding team wear ‘mits’, which are basically an oversized glove to help them catch and pick up the ball. The catcher (standing behind the batter to catch any balls missed) wears extra padding in their glove, along with leg guards, a body pad, and a helmet. To score, a batter must hit the ball with the bat into the designated fielding area and make it around all four bases (before the fielding team is able to collect the ball and throw it to the base the batter is running to). A player can score a mandatory point if they hit a home run, which usually means the ball has left the playing area, often landing in the crowd. A player can stop at any base if they feel they might not make it to the next base before being tagged out. Players can score multiple points from one hit if more than one player is already on one of the bases. When you hear the phrase 'the bases are loaded', this refers to the instance where there is a player on every base. So, every time a batter successfully makes it to first base, the other players on the second and third bases are able to trickle home, earning a point for their team each time. Depending on how many players get around to home plate before being tagged will depend on how many points you score. A maximum of four points can be scored on one hit. To win a game, you must outscore your opposition through the 9 innings played. The team with the most points after 9 innings is deemed the winner. In the event of a tie, extra innings are played until a winner has been concluded. Baseball has two teams of 9 players. The fielding team’s positions are made up of a pitcher, catcher, first baseman, second baseman, shortstop, third baseman, and three outfielders at left field, centre field and right field. Games last for 9 innings of which both teams get to bat once. If the game is a tie after 9 innings then an extra inning will be added until a winner is found. If the team batting second in the bottom of the 9th inning are already ahead in points, then they do not need to complete their batting innings. Once a batting order is picked, then it cannot be changed throughout the game. Substitutes are permitted, however, they must bat in the order of the previous player whom they replaced. If the batter manages to hit the ball from the pitcher, they must make an effort to at least get to first base. They can then run to as many bases as they wish before being tagged out. Each base must be touched with some part of the batters body when running past. A batter gets up to three strikes before getting out. 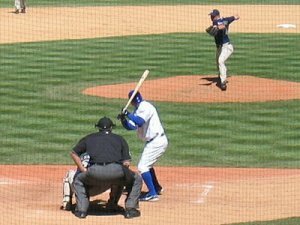 A strike is deemed when a batter swings for a ball and misses it. The batter can leave the ball but, if it’s within a certain area (called the 'strike zone'), then a strike will also be given. If four balls miss the strike zone and the batter does not swing their bat, they can walk to first base. When on base, the batter can run to the next base at any point. Players can be dismissed by either a 'strike out' (referring to a batsman missing the ball three times), 'force out' (when a player fails to make the base before the defensive player), 'fly out' (when the ball is hit in the air and caught without it bouncing), and 'tag outs' (where a defensive player with the ball tags the batsman with the ball all whilst they are running).